This book by Larry Bird and Magic Johnson is must reading for hoops junkies of a certain vintage. One of the first stories I did while at South Shore Community News involved covering the opening of the first Starbucks on Chicago’s South Side. Ald. Leslie Hairston was there, brimming with excitement. Mayor Daley was there, touting his insistence that the community get the same store design as those in the suburbs. And Magic Johnson was there. As always, he charmed the crowd, sending regards to Michael Jordan, backing off when he invoked Wal-Mart as a place moms want to go in a neighborhood, and shooting down a question from Craig Dellimore about whether the opening of Starbucks would lead to gentrification. “I’ve got some statistics up in here,” he said, in essence. After the press conference ended, I took one of the free mugs being distributed and joined the line to have it autographed for Aidan. When I got there, I shook his hand, explained that I was from Boston and had grown up watching his battles with Larry Bird and our beloved Celtics. “Those were the great ones,” he said. “We didn’t always like you, but we always respected you,” I said. As they note in the introduction to their book, When The Game Was Ours, Larry and Magic have been linked ever since their initial meeting in the 1979 NCAA championship game. While they have been the subject of a number of books, most recently Seth Davis’ work about that game and the season that preceded it, they had not written and revealed so much about their impact on each other. 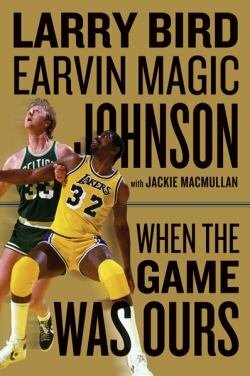 Written in conjunction with Jackie MacMullan, When The Game Was Ours is a must read for hoops junkies, especially those like me who came of age during Bird and Magic’s heyday and the NBA’s exponential growth. The book opens with a description of a dazzling play they had while on a college all-star team in 1978. Neither player got much time on the Joe B. Hall-dominated squad, and the play was not recorded, but it was one that both men remembered vividly and recounted to MacMullan. When The Game Was Ours has a lot of familiar material as this territory has been mined before, and it also has some new and juicy tidbits that eager readers will be sure to devour (I don’t want to divulge them for fear of spoiling the pleasure of uncovering something new and different.). One thing I will say is that the book does go in some detail into the 1985 Converse commercial, shot at Bird’s home in French Lick, that led to a softening in the hard feelings the two men had borne toward each other. The section about Magic’s learning he had contracted HIV is powerful and poignant. In the introduction, both men note that they are asked how the other is doing far more often than about former teammates. After reading this book, we have a better understanding of why that is so, and how much these enormously talented, driven and dedicated men have meant to each other.